Marion Weinzweig is one of the youngest living witnesses to the horrors of the Holocaust. She will share her experience of being Jewish during WWII through the eyes of a small child who lived in constant fear. She did whatever possible to fit in and go unnoticed… a little, lonely chameleon. Marion has made it her mission to share her story with as many people as possible in hopes of preventing history from repeating itself. Marion speaks to schools, colleges, churches, synagogues, various groups and organizations. Internationally, she has spoken in Germany, Israel, and Italy. It All Begins with Words: "The Holocaust did not being with killing; it began with words." This session is designed to rally your classroom around creating a welcoming community committed to stopping all forms of hate speech which leads to bias & bullying. Unchecked hatred leads to violence, murder and genocide. Help your classroom provide a framework to incorporate respect of diversity. Help your students foster a culture of respect and create a safe, bully-free learning environment for students at all grade levels.. This workshop is geared toward providing educators with specific strategies for teaching about anti-Semitism in the classroom. Participants will be provided with information on both historic and contemporary patterns of anti-Semitism with a primary focus on highlighting key aspects and issues of this form of discrimination in order to better incorporate the role of anti-Semitism into Holocaust Education. Nazi propaganda worked simultaneously on many levels: social, economic, cultural, or political. In this interactive workshop, we pursue the race-space nexus. National Socialism did not only target groups according to their radical racial ideologies but alsopromoted the conquest and settlement of (new) lands through their Lebensraum policies. We approach these issues with select examples, trying to make sense of them together. The interactive workshops concludes with a powerpoint presentation that ties together the various strands of information and discernment. During World War II, Irena Sendler, a Polish Catholic social worker, organized a rescue network of fellow social workers to save 2,500 Jewish children from certain death in the Warsaw ghetto. After the war her heroism was suppressed by communist Poland and remained unknown for 60 years. 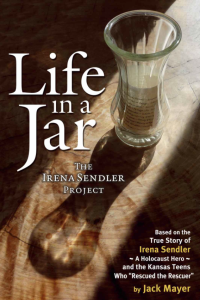 Unknown, until three high school girls from a school district in southeast Kansas stumbled upon a reference to Sendler's rescues, which they fashioned into a history project, a play they called Life in a Jar. Their innocent drama was first seen in Kansas, in the Midwest, then New York, Los Angeles, Montreal, and finally Poland, where they elevated Irena Sendler to a national hero..
November 1944, the British government finally agrees to send a brigade of 5,000 Jewish volunteers from Palestine to Europe to fight the German army. But when the war ends and the soldiers witness the horrors their people have suffered in the concentration camps, the men launch a brutal campaign of vengeance, forming secret squads to identify, locate, and kill Nazi officers in hiding. Their own ferocity threatens to overwhelm them until a fortuitous encounter with an orphaned girl sets the men on a course of action—rescuing Jewish war orphans and transporting them to Palestine—that will not only change their lives but also help create a nation and forever alter the course of world history. Phyllis Palm invites you to come along on an adventure. The journey is frightening and often sad. A 4,000 mile flight from evil will lead the reader from Frankfurt, Germany in 1938 to Tashkent, Uzbekistan in 1945. Ultimately, the family emerges triumphant, highlighting the resilience and the strength of ordinary people to overcome unimaginable challenges. The 2013 German mini-series “Generation War” was an attempt to normalize German history. The newspaper Suddeutsche Zeitung described it as "the first and last chance... to ask our grandparents about their true biographies, their immoral compromises...the missed chances to act.” How are the Wehrmacht crimes repre-sented in contemporary German film? What is the current state of coming to terms with the past in Germany, the strides to create public awareness and acceptance of German guilt? What is BDS? Who is behind this movement? What are their goals? Modern anti-Semites have taken a page from the Nazi playbook to organize destructive global boycotts against Jews and the State of Israel.